We often talk about melding man and machine, but a team of electronic engineers at the Linköping University Laboratory for Organic Electronics in Sweden has just successfully melded plant and machine for the first time. 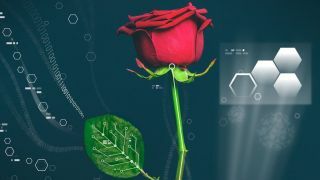 Researchers led by Magnus Berggren used semi-conductive polymers to create analog and digital electronic circuits inside living roses. The key is a substance called PEDOT-S, which when absorbed into the body of the plant forms a thin film along the channels that distribute water and nutrients around the plant. As a result, the plant can make natural transistors and other electronic components. The usual problems with organic electronics - the cold and wet - are solved by the plant when it encapsulates the PEDOT-S and protects it from the wind and rain. Potential applications down the line include smart plants with physiologies that that can be regulated by a computer, storing energy collected by photosynthesis in a fuel cell, or creating electrochromatic plants where the leaves change colour. "Now we can really start talking about 'power plants'," said Berggren, whose team published a paper in Science Advances describing the discovery. "We can place sensors in plants and use the energy formed in the chlorophyll, produce green antennas or produce new materials. Everything occurs naturally, and we use the plants' own very advanced, unique systems."